July 21, 2014 - Seven IDF officers and soldiers have been killed in Gaza over the last 24 hours, it has been cleared for publication on Monday evening. The IDF Spokesman's Office said three other soldiers have been seriously wounded, eight moderately wounded and 19 were lightly wounded in the past 24 hours. The families of the killed and wounded soldiers have already been notified. The IDF death toll in Operation Protective Edge so far now stands on 25 officers and soldiers who were killed in action in the Gaza Strip. The IDF released the names of the seven soldiers. Lt.-Col. Dolev Kidar, 38, from Modi'in, the commander of the Gefen Battalion. He was killed in the incident Monday morning in which terrorists infiltrated Israel and fired an anti-tank missile at the troops. Staff Sgt. Tal Yifrach, 21, from Rishon LeZion, a combat soldier in the Golani Brigade. He was killed in a fire exchange in Gaza in the early morning hours. Staff Sgt. 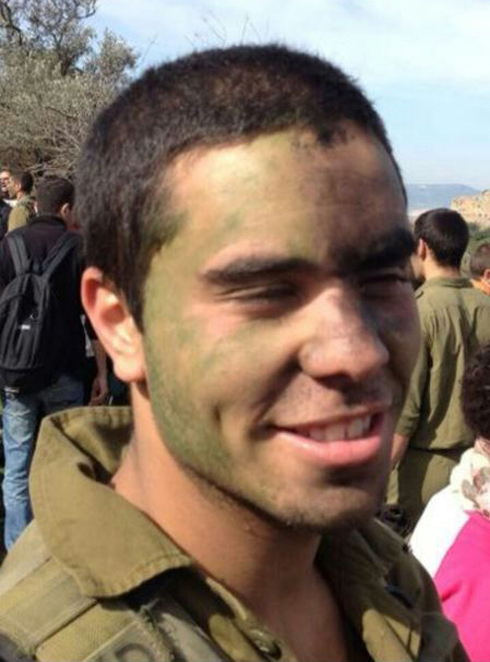 Yuval Dagan, (pictured above) 22 from Kfar Saba, a combat soldier in the Golani Brigade. He was killed in a fire exchange in Gaza in the early morning hours. He was posthumously promoted to Sergeant first class. Sgt. Nadav Goldmacher, 23, from Be'er Sheva, a combat soldier from the IDF's officers school. He was killed in the incident Monday morning in which terrorists infiltrated Israel and fired an anti-tank missile at the troops. He was posthumously promoted to Staff Sgt. Sgt.-Maj. Baynesain Kasahun, 39, from Netivot. He was a combat soldier in the Gaza Division's northern brigade. He was killed in the incident Monday morning in which terrorists infiltrated Israel and fired an anti-tank missile at the troops. Second lieutenant Yuval Heiman, 21, from Efrat, a combat soldier from the IDF's officers school. He was killed in the incident Monday morning in which terrorists infiltrated Israel and fired an anti-tank missile at the troops. He was promoted to Staff Sgt. on the event of his death. He was posthumously promoted to Lieutenant. Staff Sgt. Jordan Ben Simon, 22, from Ashkelon, a combat soldier in the Golani Brigade. He was killed in a fire exchange and the events leading to his death are still being investigated. He was posthumously promoted to Sergeant first class. Staff Sgt. Yuval Dagan was supposed to be released from his army service in a short while. His uncle Yossi said: "Yuval insisted on being a combat soldier because in our family, everyone are. His father and brother were in commando units and he insisted to enlist and become a commando like the rest of the family." The uncle went on to say: "Yuval loved life, loved giving back to the community and before he joined the army, he spent a year in a center for at-risk youth in southern Israel. We still can't believe he's been killed." Dagan was raised in Kfar Saba, and graduated from Herzog high school in the city. His friends said he was "a wonderful person, friendly, amicable. Always with a smile on his face, he aspired to greatness, he was a creative person. We're all shocked."